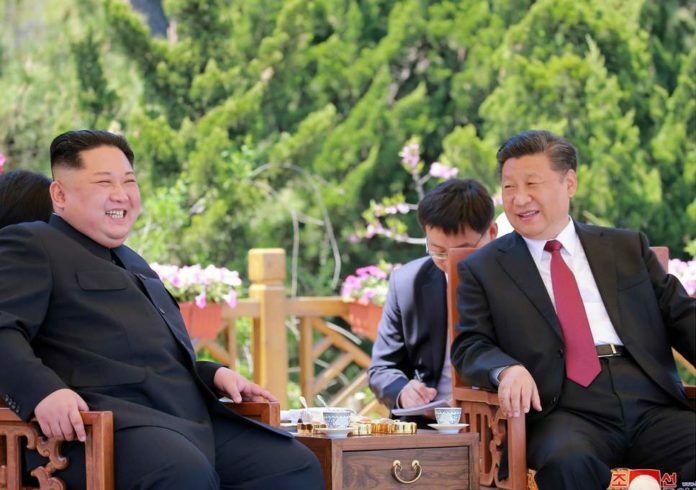 Supreme Leader Kim Jong un of the Democratic People’s Republic of Korea (DPRK) and his wife Ri Sol Ju paid yet another visit to the People’s Republic of China President Xi Jinping on June 19. This is the third time in as many months that the head of the Worker’s Party of Korea (WPK) has held face-to-face talks with his counterpart Xi Jinping and his wife Peng Liyuan of the Communist Party of China (CPC) in Beijing. The two Asian socialist heads-of-state held discussions on the recent developments involving the ongoing dialogue between the Republic of Korea (south) and the DPRK over issues of normalizing relations and potential unification. These important questions along with the summit meeting held with United States President Donald Trump on June 12 in Singapore have created tremendous interests throughout the international community. Just in a matter of months there have been momentous events which are reshaping the character of inter-Asian relations as well as exposing the fallacy of Washington’s decades-long foreign policy towards both the DPRK and the PRC. Trump’s statement in the aftermath of the Singapore Summit that the Pentagon would suspend the annual war games in South Korea during August, sent shock waves throughout the military-industrial-complex in the U.S. Whether or not the dominant imperialist state extends this suspension beyond 2018, it illustrates the futility of Washington’s posture toward the Korean Peninsula. Both China and the DPRK have been the principal focus of successive U.S. administrations as it relates to their attempts to maintain imperialist interests in the Asia-Pacific region. A united approach from Beijing and Pyongyang will signal to Washington that their maneuvers in the region will not divide the major players as far as regional security and anti-imperialism is concerned. Nevertheless, the overall objectives of the U.S. and its allies remain the same: to further contain China and marginalize those interests which are steadfast in maintaining the national and regional independence of the various states. Both leaders pledged in the June 19 meeting to strengthen and deepen relations in the coming period to ensure the continuing forward progress towards peace and development in the region. Beijing has been acting as a mediator between Pyongyang and Washington after the escalation of tensions during 2017 brought the two states to the brink of a full-blown military conflict. There has never been a comprehensive peace agreement since the armistice of June 1953 after three years of war which resulted in the deaths of millions of Korean and tens of thousands of imperialist troops led by the U.S. and Britain under the banner of the United Nations. Annual military exercises held jointly by Seoul and Washington in April and August involve 17,000 ROK troops along with over 50,000 Pentagon soldiers. In exchange the DPRK has agreed to suspend testing and upgrades in its nuclear weapons program. The socialist state has developed long-range Intercontinental Ballistic Missiles (ICBM) weaponized with nuclear technology. These military options created by the DPRK are for exclusively defensive purposes in light of the persistent decades-long threats from Washington and Tokyo. Japan had occupied the Korean Peninsula after a 1905 treaty which led to an occupation extending from 1910-1945. After the defeat of Japan in World War II, an alliance of patriotic forces led by the communist party founded the DPRK in 1948. The three year war and ongoing occupation of the south has hampered the unification of the Peninsula. The June 12 meeting which brought together Trump and Kim came on the heels of a contentious Group of 7 (G7) meeting in Quebec. Relations among the imperialist states have been strained due to the trade war initiated by the Trump administration which has imposed tariffs on Canada along with European Union (EU) nations. These events have prompted a high degree of volatility in the U.S. and world financial markets where a precipitous decline occurred on June 19. Most economic analysts attribute the drop in values to the trade policies of Washington. China is also a major target of Trump’s efforts to mislead the public in the U.S. suggesting that the imposition of tariffs will result in job creation and salary increases for working families who are still suffering from the fallout of the Great Recession of 2007-2011. A large portion of employment growth in the U.S. is through low-wage labor in the service sectors. Income has remained stagnate while real wages have been on the decline for several decades. The suspension of war games and nuclear testing was not written down as a point of agreement although Trump’s post-summit press conference affirmed these decisions. Trump asserted that the joint Pentagon-ROK exercises are far too expensive and should be curtailed. Nonetheless, these discussions cannot conceal the continuing provocations by Washington against the PRC. In addition to the trade war which is destabilizing markets around the world, the Pentagon is still seeking to militarily intimidate Beijing in the Asia-Pacific region. China has responded to repeated military incursions by the Pentagon surrounding the South Seas which Washington contends are not the sovereign territory of Beijing. The U.S. is accusing China of militarizing the South China Sea which has prompted the Defense Department to withdraw an invitation for China to join an international naval exercise the U.S. is sponsoring over the next few weeks. The Pentagon claims that China has deployed anti-ship missiles, surface-to-air missile systems and electronic jammers to areas in the Spratly Islands. Washington has demanded that China withdraw these defense systems. These military efforts by the U.S. have continued through successive administrations. China’s growing economy and military capability are viewed as a major threat to the imperialist hegemony of Washington and Wall Street. Tensions could rise to the level of a direct military conflict whose outcome would be long term in its political and economic impact. The burgeoning trade war and military posturing will undoubtedly result in global uncertainty and instability throughout various continents.